Went to the studio today to give it a good clean and sort out, as I’d just dropped off a load of gear on Thursday. As a distraction from the tedium of cleaning I printed a few quick VDBs. 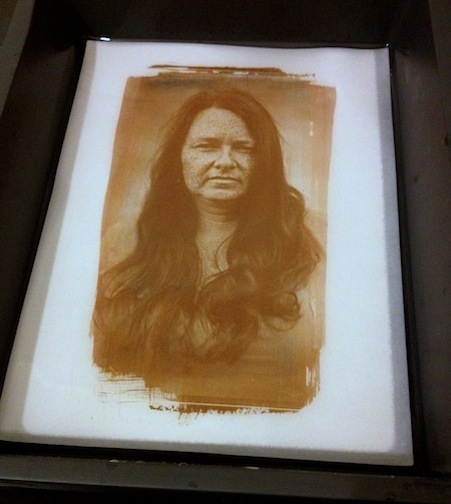 I used a clear glass ambrotype test plate of Steph from day 2 of the Gatehouse of Fleet wet plate demo sessions. (That blog post to follow when I get copies of the plates). No idea what the paper was, it was pretty lightweight but I like the finish. Double coated VDB, one drop of Potassium Dichromate 1% in first coat. 5 minutes with the UV tanner. These jpegs dont do the print much justice. 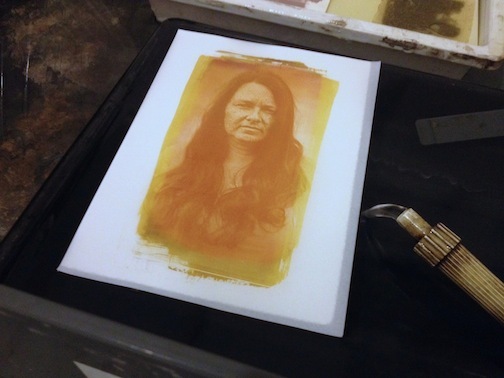 Should dry a tad darker/browner…. 22 Jun This entry was written by Fourtoes, posted on June 22, 2014 at 8:16 PM, filed under Alternate Processes, Wet Plate.. Older: A Victorian wet plate negative.